I had a large block of time on Thursday morning. I decided to use it to deal with some packages of beef soup bones that have been in my freezer for a while. Every fall, we get beef from a farmer friend of my sister. Every year, there are packages of beef soup bones. They were stacking up. I am determined to make room in my freezers and use things that have been there for a while. I then divided the bones, and filled both pots with water. I added salt and boiled, then simmered the broth for about 3-4 hours. A scum rose on top of the broth and bone mixture. I skimmed it off and fed it to the cats. In the meanwhile, I washed my jars. I partially filled the empty jars with extremely hot water, to avoid breaking them. You do not ever want to put hot liquid into a cold jar. Then, I put the broth in the jars, put on the lids and screw tops, and put into my pressure canner. I pressured-canned the broth for 20 minutes at 11 pounds of pressure, following the directions in my brochure from the OSU Extension office. When done, according to directions, I cooled them on a towel on the counter. My yield was 7 quarts, and 15 pints of broth. I also got a large bowl full of beef chunks that I froze for future meals. Now my freezer is a little emptier, and the broth is in a form where I can use it quickly and easily. I’ve only tried making chicken and turkey broth at this point, though I have definitely thought about buying beef bones to try making my own beef broth. I always boil the bones with veggie scraps, an onion and some garlic. I enjoyed reading how you do your broth, though. It’s good to know that the veggies are not necessary if I don’t happen to have some. Thanks for sharing! I am sure the veggies would give more flavor, or a slightly different flavor, but I’ve always done plain broth–just bones, water and salt. At times, I’ve had people in my life who can’t handle onions, or garlic, or _____ so adding those things later on, when I make the soup, if my “audience” can tolerate them, is the way I go. At other times, I’ve had to buy vegetable broth because certain people can’t eat anything with beef in it……but I guess I could have made it:) Never a dull moment, is there, when dealing with food intolerances? 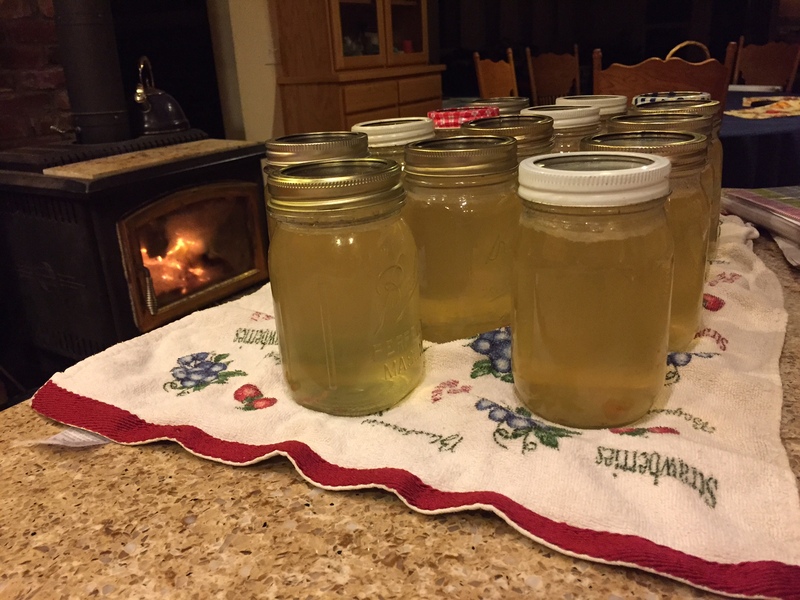 I canned beef broth this week too! Not nearly as much as you though, only eight pints. That must have been one big soup pot! It is! And, I filled a second, smaller (but still big) pot as well. I figured if I’m going to go to that much work in getting all the supplies out, taking all morning, etc. I wanted a lot of results! I had a couple not seal, so there’s probably beef soup in the menu plan for next week.